Colorful Countdown to Christmas advent calendar. 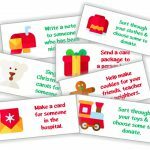 Activity ideas are inserted into each pocket to help spread the joy throughout the month. A die cut machine was used for this project, but you can be creative and create your own design. Use the Coin Envelope die for the pockets and embellish each day with 'Be Splendid' dies! The number labels are made with Nesting Eyelet Circles, Nesting Circles, and the Tiki Alphabet. Inside each pocket is a Christmas activity for the family. Use the Nesting Frame 2 die to make these. They fit perfectly inside the Coin Envelope die. Here's our list of activites...but feel free to make your own! This craft is reprinted courtesy of FaveCrafts.com. Go shopping, have the kids buy gifts for their friends, come home and wrap!